The Biblical Rembrandt presents the human Rembrandt in the context of his faith. That faith can be studied only by an intense look at his paintings, etch-ings, and drawings depicting biblical persons, scenes, and moments. About Rembrandt’s life, we know very little that is certain, but he has left us abundant testimony of his sensitive reading of the Bible. Written from the perspective of a biblical specialist who has pored over Rembrandt’s testimony, Durham writes not for the art historian, but for those who love the Bible, for those who love Rembrandt, and for those who want to know more about the meeting of this Dutchman and his biblical text. 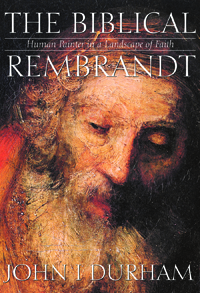 Durham confesses he has lived with the (changing) canon of Rembrandt’s works for more than forty years, “with the biblical texts he loved open before me.” This book is the summary of that experience. Not every work of Rembrandt based on the Bible is discussed: that would have required com-mentary on more than 900 works. Durham has selected his favorites, the ones that seem to him most reflective of Rembrandt’s faith, about 130 works in all. Each of these paintings, etchings, and drawings is reproduced in the context in which it is described, the paintings in full color. Where important details are difficult to see, they are isolated, and enlarged as necessary. In his biblical works Rembrandt invites us to read the Bible just as he read it, in personal terms: flawed, as he was; reaching, as he did; and experiencing the Bible as a book about ourselves.